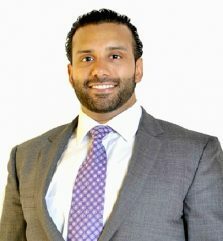 Rishi K. Desai, Esq. is a Partner with Pasricha & Patel’s Commercial Transactions Group. Rishi’s practice is focused on advising business owners on the purchase, sale, leasing and financing of their businesses and commercial real estate. He regularly counsels business owners on a wide range of transactions, providing the highest standard of customer service and individualized attention for each client regardless of deal size. Rishi has closed title on the purchase, sale, and financing of a variety of business enterprises and commercial real estate, ranging from smaller acquisitions, such as restaurants and retail stores to liquor stores, hotels and healthcare facilities, to larger, multi-unit franchise purchases with commercial real estate. He regularly prepares, reviews, and negotiates documents pertaining to every aspect of a transaction, including Purchase and Sale Agreements, Leases, SBA and Conventional Loan Documents, as well as associated Corporate Governance documents. Rishi is licensed to practice law in New York and New Jersey. He is currently the President of the South Asian Bar Association of New Jersey, as well as a member of the Diversity Council Committee for the MID Jersey Chamber of Commerce. In his spare time, Rishi enjoys spending time with his wife and dog, exercise, nutrition, and exploring new cuisine. Connect with Rishi K. Desai on LinkedIn.